2016, Bar Harbor Pride, Criterion Theater, Bar Harbor, ME. 2015, The Actors' Gym, Hampton, CT.
2008, Winner, Lambda Literary Award in Drama, (The Second Coming of Joan of Arc and Selected Plays). 2010, Excerpt, Society of the Muse of the Southwest (SOMOS), Taos, NM. 2009, Black Hills Equality Pride Festival, Rapid City, SD. 2009, Maine Association of Community Theatres Conference, Auburn, ME. 2007, Published in The Harbor Journal, Cozy Harbor Press, Southport, ME. National Women’s Music Festival, Univ. of Illinois, Normal, IL. Off-Broadway performance, Bleecker Street Theatre, NYC. New England Academy of Theatre One-Act Play Festival, New Haven, CT. Published in Harrington Lesbian Fiction Quarterly, Binghamton, NY. Finalist, Maine Playwrights Award, Acorn Acting School, Portland, ME. Cornelia Crosby, a 19th century lesbian, was the first licensed hunting guide in Maine. Six feet tall and known as “Fly Rod,” she led fishing and hunting expeditions for wealthy vacationers in the Rangeley Lake district. 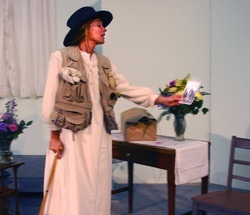 The play opens on the day that Fly Rod, who has been sidelined to a hospital bed in Portland with a serious knee injury, is scheduled for surgery. She may, in fact, never walk again. This prognosis poses a threat not only to her livelihood, but also to her plans to rendez-vous with Annie Oakley in New York at the annual Sportsman’s Exhibition. Having listened to the stories of Annie’s sexual abuse as a child, Fly Rod has become obsessed with “rescuing” her. Hoping to lure Annie away from the Wild West Show, Fly Rod proposes to teach Annie the art of fly-fishing. Explaining the difference between “imitations,” the flies designed to replicate actual species of insects and “fancies,” the flies that make no attempt to resemble anything except themselves, Fly Rod notes that she and Annie are “fancies”—like the Parmachene Belle. It is her dream to wean Annie away from her obsessive practice with guns. Fly Rod’s optimistic fantasizing is disrupted when she opens a gift that Annie has sent her. It is an arrow case that belonged to the famous Indian warrior Sitting Bull. Disturbed by the potential meaning of the gift, Fly Rod reflects on the death of Sitting Bull, who was killed for his participation in the Ghost Dance, a form of ecstatic trance-dancing believed to bring back the buffalo and get rid of the white man. Outcasts, misfits, and survivors—Annie, Fly Rod, and Sitting Bull all struggled to invent ways to continue in the face of shattered dreams and hopeless prospects. Fly Rod, in her monologue, wrestles with her fears and negotiates the fine line between faith and denial as she constructs a system of belief that will hold some possibility of happiness for her, a lesbian in a heterosexual man’s world.